According to the National Candle Association, candles illuminate 7 out of 10 households to add light, warmth, relieve stress and set the mood. Doesn’t it make you wonder what’s going on in those other 3 homes? The warm glow from candles has been used to light the way for the last 5,000 years, as far back as the early Egyptians and ancient Romans. Today we see a wide array of waxes to make candles, boundless choices of fragrances, and various shapes, sizes, and formations. 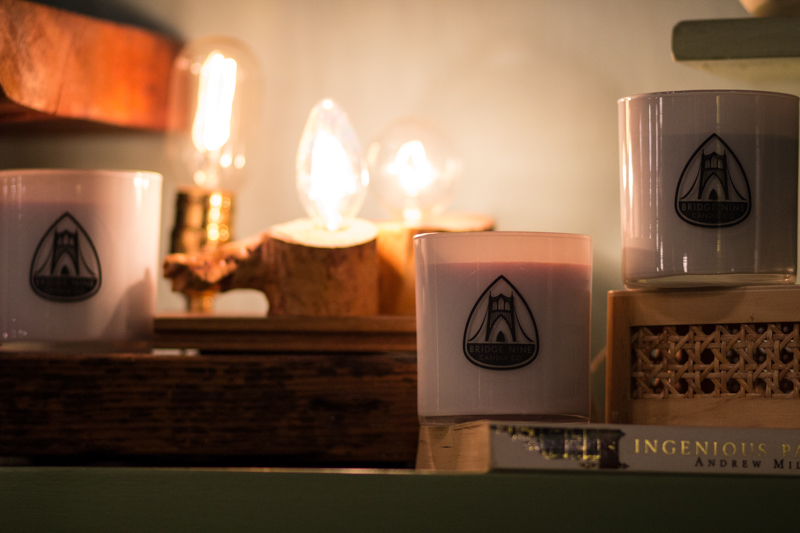 Chelsea Arvesen, entrepreneur and founder of Portland-based Bridge Nine Candles, understood the consumer’s attraction to the flicker of a beautifully made and handcrafted candle. About four years ago when she found out her favorite local candle maker was moving, she tapped into her creative skills, checked out some basic recipes online, and began tweaking and adjusting a formula to make her own candles. Then she realized it could be a successful business, capturing the heart and soul of the Pacific Northwest. The Bridge Nine owner has a keen business sense and a discerning eye for detail. Chelsea built her brand with purpose, developing the eye-catching logo with a friend in graphic design, and she wanted the candles to be clean and classic pieces that would add décor to any home. “That’s always been the mainstay: keep everything clean, and simple, but definitely recognizable,” Chelsea explains. 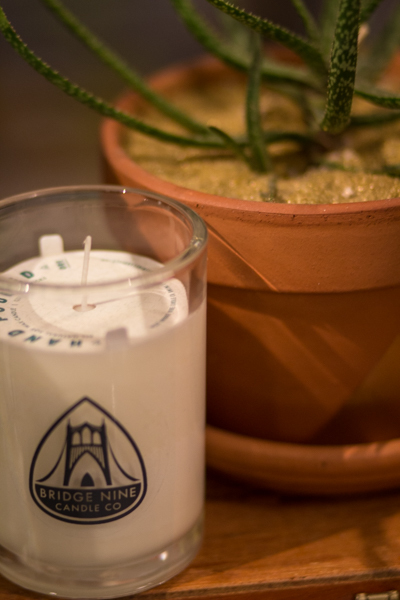 “If someone saw it, they would know it’s a Bridge Nine Candle.” The logo for Bridge Nine reflects Portland’s iconic St. John’s Bridge, and the name represents the nine major bridges that cross the Willamette River – a true nod to some of our favorite things in the city. When you purchase a Bridge Nine candle, you know that each one is designed by Chelsea and hand-poured, using her special formula. First, she sets her wax melter at a specific temperature to get the right consistency of the all-natural soy wax. She then adds any color if needed, generally for her seasonal or holiday scents. Next, she waits for the wax to cool a bit and adds essential oils or fragrance oils to create her signature scents, like Oregon Lavender (all essential oils), Portland Mist, Mint Julep, or her most recent addition, Pacific Sea Salt. Any fragrance oils used are free of formaldehyde or harsh phthalates. Chelsea places her cotton wicks at the bottom of the glass or tin before she pours the creamy wax into the vessel, and then lets them cool further before the candles hit the shelves. Bridge Nine candles are sold in nine retail shops in the Portland area, like Salty Teacup in St. John’s, which Chelsea considers her flagship store. The candles are also available though her website for purchase, and she will even custom order candles for special occasions or corporate events, like for wedding favors or as gifts. Because sustainability is so important to her, all of the heavy-duty Libbey glass or canning glass containers can be recycled, reused for different purposes like holding small flowers and toiletries, or brought back to Salty Teacup or Sweet Jane on NE Broadway for a $1 credit on a future candle purchase. From her time as small business owner over the last four years, Chelsea has identified the importance of distinguishing between creative things to pursue for work, yet separating those activities to set aside and hold sacred. For her, painting is a creative outlet she enjoys when she feels inspired to take the brush to the canvas, versus an on-demand activity. “You don’t want to turn something that you absolutely love and can’t live without into a business without really thinking about it because it might ruin it for you,” Chelsea shares. “And that’s not how it has been with candles for me because I haven’t been making candles my whole life. But with painting, that might have done that for me…painting is more of a hobby for me.” This type of self-awareness is how Chelsea finds balance in her work and creativity. Chelsea’s longer-term priorities include expanding outside of Portland, potentially to Seattle or San Francisco. She is currently adding a box for the candle tumbler to create ease in shipping and to showcase a more finished product that she can present at shops outside the Rose City. Her ultimate goal is to build more familiarity with her brand and reach other markets. “I would love to be in Seattle and San Francisco, that would be awesome,” Chelsea shares. Running a business of designing and creating candles seemed to click for Chelsea. Because her husband is a small business owner as well, he gives her additional motivation to stay the course, as well as guidance and advice. He’s even helping to expand her studio this year so she can keep up with the growing demand. “It’s so different than a 9 to 5,” Chelsea explains about operating her own business. “One, you pour your whole heart and soul into it. Two, it never ends. So you need to like it. I can always find things to work on or things that need to be done. But at the same time, you need to find a balance and not work yourself to death.” None of the other jobs she has had over the years have fulfilled her in the same way as owning her own business. When Chelsea talks about her candles, the new scents she’s excited about, or her plans to grow in the future, you can just see her light up. “There’s nothing like it,” she smiles. Despite the challenges, Chelsea wouldn’t have it any other way. “Something about owning your own business is so fulfilling,” she shares. “You’re building it yourself and you’re either failing or you’re succeeding and it’s all based on what you’re doing. And I like that.” Someone following their passion – well, I really like that, too. Check out Bride Nine Candle Co. to learn more! Beautifully written and gorgeous photos!